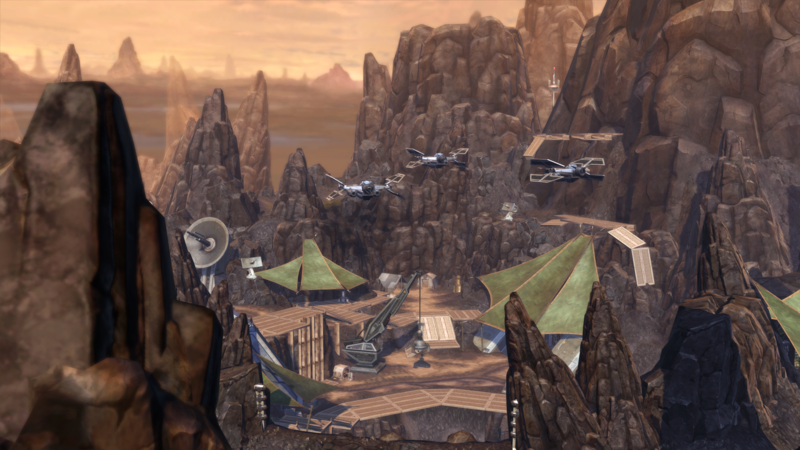 Built into one of the craters created by the Imperial bombardment, Outpost Victory began as a small outpost of resistance fighters. Over the years, however, it has grown into one of the resistance's major outposts, guarded by enormous anti-aircraft guns and shields to defend against orbital strikes. Imperial prisoners captured by the resistance are often held in Outpost Victory, and lately there have been unconfirmed rumors of a Republic presence at the outpost. This is a screenshot of the Imperial bombing run on Outpost Victory.